A most auspicious Wednesday to you, dearest, prettiest, best-pony-est, best-smelling readers! It's time for another installment of Weekday Escape, and we have a batch of fine, fresh, and of course free escape games to tickle your fancy. Elle is off taking her annual amateur piggy-back sabbatical, or at least that's what she's doing as long as I'm the one writing this and nobody is around to stop me, so this week you're stuck with me again. And Neatescape. And Yomino Kagura. And no1game. So I hope one of you remembered to bring snacks and board games, because it's getting crowded in here. Bonneville - If you think no1game is all about little green men, think again! Curiously silent apart from some jarring sound effects, this little locked room has a great view, a television set, and minimalist decor, but not much else... heck, there's not even a computer for you to check memes on Tumblr, though if you're like me, you've probably had your fill of social media these days anyway. Click around to explore and search everywhere, especially since there's no changing cursor so you never know where a clue or item might be hidden. Yellow Walls Escape - How do you suppose these protagonists keep getting trapped in escape games anyway? Is it just like, "Hey buddy, come stand in this disconcertingly featureless room with cryptic paintings on the walls while I shut the door for a second because that isn't creepy at all"? This time, Yomino Kagura serves up some satisfyingly smart and straight-forward logic puzzling as you use your wits and your eyes (... well, obviously) to decipher clues to the many locks around the room. A changing cursor helps cut down on the pixel hunting, and in no time you'll be living the high life again. Or at least not trapped in a room with no toilet, which is definitely a step up. Escape from the Japanese Style Hotel - Neatescape's latest may be a little clunky and unintuitive in places, but gosh if that soundtrack ain't pretty. Which is fitting, since as the title implies you're trapped in a very picturesque room with a nice big TV, a (understocked) minibar, and some well-tended bonsai... though curiously enough, no bed. Some players might find this frustratingly clicky, since click detection doesn't always seem to be spot on, but unless you want to be sleeping on bare tatami mats tonight, you'll get to hunting. Weekday Escape N°46 Walkthrough now available! The four-letter code is located behind the green shelves. 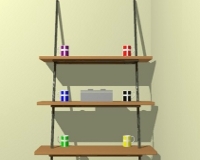 Look below the top shelf, or above it after moving the blue coffee cup. The four-digit code is located on the red wall clock. But notice the "-2" on the clock-like circle on the wall above the box. You need to subtract 2 from each digit of the code. First you'll need to get hold of the YELLOW and BLUE CLOCK HANDS. The yellow hand can be added immediately, but the blue hand is missing a center hole. Add the LEVER to the device on the porch and pull it to turn day to night. The circling butterfly will now land on the fence, triggering a hole punch mechanism in the railing below. Remove the mechanism cover and insert the BLUE CLOCK HAND to punch a hole. Add both hands to the "clock" toy and press the buttons on the sides until they point to the colors indicated by the art on the upper shelf. Press the red spike on the top of the toy and take the RED CLOVER KEY. Use the RED CLOVER KEY. Top drawer of the brown cabinet, protected by the red box code. Porch doorway panel, protected by the four-letter code. Bottom left drawer of the brown cabinet. Gray box below the television. Gray panel next to the plant. Sewn into the couch: use the KNIFE. Then use the HEXAGON WRENCH to remove the top of the lever. 1. Check the table to the right of the door. We need to find a code with 4 different colours. 2. Have a look at the painting above the bed. 3. Replicate the pattern of the painting at the table. 4. Take the piece of paper and examine it. 5. The piece of paper you gained at the star-section contains the hint for the cup-shelves. 6. The cup-shelves contain a box with two buttons: one on the left, one on the right. 7. Take note of what side each cup colour can be found. Purple, blue and green on the left. Red, black and yellow on the right. 8. Combine the sides with the order found on the piece of paper. 9. Take the silver key. 10. Use the silver key from the cups-box on the cupboard on the right. 11. Take the handle and the stick/pointer. 12. Use the pointer under the bed to reach the screwdriver. 13. Have a look at the middle cupboard and notice that it won't open. 14. 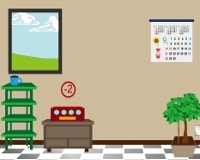 Click on the top of the middle cupboard to get a top-view. 15. Use the screwdriver to remove the screws. 16. Open the middle cupboard and get the red circle. 17. Add the handle to the floor hatch between the bed and the cup-shelves. 18. Add the screws and fix them with the screwdriver. 19. Open the hatch and take the blue square. 20. Note the yellow diamond and the number 6. 21. Have a look at the end of the bed and note the red diamond with the number 10. 22. Have a look behind the seascape painting and note the blue diamond with the number 73. 23. Go to the left cupboard and do the math. 24. Open the cupboard and take the yellow triangle. 25. Have a look at the box that is hidden behind the seascape painting. 26. Add the red circle, blue square and yellow triangle to the box. 27. Open the box and take the golden key. 28. Use the golden key to open the door and escape. The key to getting the middle cabinet open is to click on it with the screwdriver until you somehow get the above-the-cabinet view. Which shows you that it won't open because of the screws. put it under the chair on the right in that outer balcony/room thing? I think I've been clicking everywhere trying to figure out where to put it and not getting anywhere, even with your clue. It just sits in my inventory mocking me. Help! I have also managed to "lock" the top two buttons on the "safe" but havent managed to lock the final bottom button. I managed to open the safe, but there is nothing useful to me in it... I'm with bavnah, unable to melt the ice. Put it in the bowl of water and move around the whole room. No chairs necessary! Have you paid attention to the markings over the sliding doors? How about the box under the tv? Clicking on the "Weekday Escape" banner takes you to a tag search, which doesn't include #46 on it. @neo1973: I've noticed that in the past as well...I'm guessing that the tags only get reindexed a few times a day, but that it'll show up once they do. but I can't put one in the other! could someone make a step by step walkthrough for Bonneville? i'm very confused. A little hard to see. Man, I was making the safe WAY too hard. I'm having trouble with the hotel. Very frustrated actually. Areas that should be responsive that aren't, and items that I should know what to do with but I don't. I'm able to zoom in on the plate of brown thingys between the safe and freezer and the ones on the table, but not sure what they mean. There is a clock? 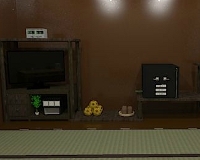 above the TV, the TV itself, some device on the left chair on the balcony, and a green piping contraption inside of a safe, that are completely unresponsive. There's also a door of some kind that needs either a key or a screwdriver (not sure which), neither of which I have. I have a battery that won't work on anything, a pair of tweezers? that I have no idea where to use, a flashlight I've used once but don't know where else to use. Also, I have a bowl and a block of ice that I assume I'm supposed to combine somehow with the water in the water kettle, but the game no longer lets me open it. So yeah, frustrated. I'd be pulling out my hair and throwing my laptop across the room if it weren't for the extremely calming music. :p Am I missing a pixel-hunt to some obscure area? Help or suggestions for any/all of the above would be appreciated. Wow. I just now got through Hotel Escape (with mostly random clicking). The rest of the escape should be easy enough with these two clues. In Hotel Escape, I have water in the pot which will no longer open, the bowl and the block of ice. I have been waiting for the water to heat up, but it doesn't seem to. Now what? Once you have the water in the pot, then you can put the block of ice into the bowl. After that, just walk around the rooms a couple times and the ice should melt in the bowl. There's no need to open the pot any longer (although that's not super obvious). To get the hot water in the bowl, I just remember highlighting the bowl, and clicking all over the thermos/electric tea pot. The first time I tried this, it didn't work. Eventually I came back to it and tried again and it worked. I would try making a full circle around the room to allow the tea pot to heat up the water, and then trying. I think that's why it worked for me the second time. I'm not having any luck figuring out the clock thing in hotel escape. I put the water in the thermos thing, but no matter how many times I circle the room and click on it with the bowl, it won't do anything. I can't put the ice block in the bowl either. Is there something else I'm supposed to do? I already solved the safe puzzle, got the remote and flashlight... I'm at my wit's end! At least the music is pretty zen. I collect the bowl and heat the water first and am unable to use the bowl on the water kettle. I solve another puzzle and find another item, and try again, and it still won't let me fill the bowl with hot water. Once I have collected the batteries, remote, ice, and hammer, from solving the TV/clock puzzle and opening all the safes, then it lets me fill the bowl with water, no trouble at all. This could explain everyone's frustration (including mine) with the tea kettle. First do everything else, then try. Worked every time for me. if not, it's ok but the walkthrough is impossible for me to follow on Bonneville. JUDY thank you for that tip, I went through and solved some of the other puzzles and found some items I hadn't yet found, it worked! Though you do not get any notification that the bowl's been filled. Look at the object on the top of the colour code box. There was a set of three of those on the table you see when you first enter the room. They have the colour code for you! Thank you, Squiddly! I'm out. Now I just feel plain silly for missing that clue. Yes, I couldn't find it on Wednesday. How can you get to this page when it comes out? Ugh. I did not like Japanese Style Hotel at all. Tons of pixel hunting, one pertinent area obscured by shadows, and objects with MC Hammer disease (can't touch this). For me at least, I hereby change Neatescape's name to Notescape. I did enjoy the other two games.